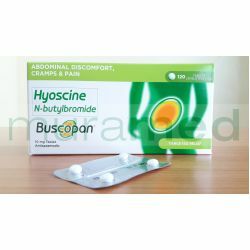 Used to relieve abdominal pain or cramps, and other stomach discomforts. Each sugar-coated tablet contains hyoscine-N-butylbromide 10 mg.
Xerostomia or dy mouth, tachycardia, urinary retention, allergic and skin reactions; Rarely dyspnea (difficulty breathing or shortness of breath). This product should not be taken by patients with known allergy to hyoscine or to any of its components,nor those with myasthenia gravis (rare muscle weakness or fatigue) and megacolon (massive distention or stretching of colon).